Call me old school, but I’ll always be a Peter Furler as front man Newsboys fan. “Shine” and “Breakfast” rank as a couple of my favorite songs of all time. That said, the Michael Tait led Newsboys are pretty great too. Per usual, the title is only a hint at my post’s content. This time it’s a review of the movie God Is Not Dead. This movie appealed to me. I like going to see movies that are faith-based. I love seeing God glorified as the source of power and strength for the characters. That said, I like salt (preferably jalapeno-flavored) and butter on my popcorn but too much, and it’s inedible. That goes for movies too. I paid money to see a movie not a sermon. I get those free on Sundays and save up money for retreats. How did God Is Not Dead measure up? I give it four stars and one Gouda wheel on the cheese factor. The acting was good. The characters believable and multi-dimensional. The best part of the movie is how the main character defended his faith. He went outside of “The Bible says” argument. Instead, he jumped off with the assumption that the Big Bang Theory is correct, quoted Darwin and Steven Hawking as well as other leading secular scientists, and ended with something the atheist viewpoint of the professor didn’t offer. My husband and I really liked this. We’re engineers so the scientific arguments had to hold weight. I lean toward the “old earth” (millions or billions of years) theory rather than the “young earth” (6000 years based on the Genesis timeline) theory. My argument is that the Bible is a history book. It’s meant to tell a story not explain science. I also say that if I found out the earth really is 6,000 years old, it wouldn’t shake my faith. The other part I liked was the character Mina. She is arguably the most central person, a complex character, and a believer who’s shown purchasing a bottle of wine in her first scene. Without saying much more, this gives you an idea that Christian movies are daring to widen the concept of what a Christian looks like. Not to mention there are characters of various cultures, faiths, and ethnicities, which made the story deeper, richer, and more real. What I didn’t like. There were a couple of places where the dialogue was a bit stilted and a little preachy. That said, these are a few minutes out of two hours. Most of the movie wasn’t like that. My biggest complaint is that one of the main character’s story went a step too far. If his story had been wrapped up with him pulling out a letter and looking at the newspaper, the audience would have come to the right conclusion. However, there was a “but wait there’s more”, just-in-case-you-didn’t-get-it scene. That’s where the Gouda wheel makes its appearance. I understand wanting to share the gospel but to me faith-based books and movies should serve one primary purpose – to entertain. If the audience member is a believer, then they don’t need the message. If the audience member isn’t they’ll either be offended, enjoy it but be unaffected, or ask questions. That’s where we as the Christian friend who recommended the movie comes in. We ask our friend how they liked it. What they thought about such and such scene, character, theme. I repeat, you don’t pay money to listen to a sermon. Now on to another related topic. This year there have been a lot of Christian, inspirational, and Bible story-inspired movies. Son of God, Noah, God Is Not Dead, Moms Night Out, and Heaven Is for Real come to mind. Some of these movies have generated a good deal of controversy. I’m not going to weigh in on that beyond these words from the Apostle Paul in his letter to the Philippians. “Some indeed preach Christ from envy and rivalry, but others from good will. The latter do it out of love, knowing that I am put here for the defense of the gospel. The former proclaim Christ out of selfish ambition, not sincerely but thinking to afflict me in my imprisonment. What then? Only that in every way, whether in pretense or in truth, Christ is proclaimed, and in that I rejoice.” (Philippians 1:15-18, ESV). That passage is wedged between the oft-quoted verses about thanking God for our fellow believers and that we can do all things through Christ. It might not be as popular, but it’s no less scriptural. Whether or not you choose to see any, all, or none of these films is a personal decision that I hope you make with an open mind and prayerful heart. Remember the saying “the book is better than the movie”. So such-and-such flick might have taken liberties with God’s word, but if it encourages people to read the Bible, then maybe it’s worth it. Not to mention movies are made to make money. This means if we as Christians support faith-based movies, more will be made. Which of these films have you seen? Which ones do you want to see? Are there any you won’t watch? 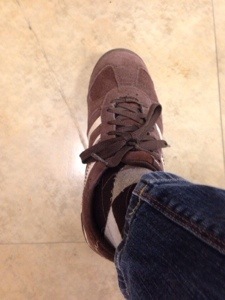 Yes, I’m wearing argyle socks with suede sneakers from Payless that I bought 7 years ago because that’s how I roll. The other day I commented that I’ve never been smarter, prettier, or cooler. It’s not that I think I’m some sort of genius in a killer body with a gorgeous face. I mean if that’s your opinion of me, I’m flattered, but it’s not what I meant. It’s that I look in the mirror and like what I see. And the part I don’t see. That I’m truly comfortable being me. And this year, I’ve been on a mission to set up better habits. This has become the year of goals. But the whole thing is realizing I’ve always been cool. We’ve been eating Greek yogurt for nearly a decade. Way before it hit the shelves of Safeway. Everyone on Facebook seems to be into ethnic food. My husband and I have been frequenting Indian, Middle Eastern, and other cuisines our entire marriage. It wasn’t borne as much from being foodies or overly adventurous but because those are the restaurants with two-for-one deals in those giant coupon books. Now we go for ethnic food coupon or not because these are places we don’t have in our small town. It’s not just eating habits but music, games, and movies. Sirius XM has, at least for the next few weeks, not one but two stations dedicated to my favorite musicians. I’ve been a Parrothead since childhood so Margaritaville has been on my favorites stations from the beginning. I mean I know deep tracks of Jimmy Buffet’s by heart. Ones that aren’t even on Beaches, Boats, Bars, and Ballads. “Come Monday” and “Incommunicado” (both on Ballads) are still my favorites. But so is “This Hotel Room” and “Ringling, Ringling” two songs that remind me way too much of childhood vacations off the beaten path. Now they’ve added the Billy Joel channel as a limited engagement. I’ve been a fan of The Piano Man since my tweens. In college there was a rather funny incident about my being a Billy Joel fangirl (before there was a word fangirl) and a guy’s failed attempt to ask me out. I blew the guy off and totally forgot about it until two years later I spotted a fake advertisement referring to it. Some mutual friends had turned the episode into a meme (before we actually used the word “meme” or pictures of the Dos Equis guy to make them). The Goonies, The Princess Bride, and Pretty in Pink were movies I’ve loved since they were released on VHS, way before they became cult classics. Actually, I saw Goonies in the theatre. The Settlers of Catan (which we’ll be playing as a family as soon as I hit schedule) has been one of our favorite games for a decade. That doesn’t exactly make us original settlers or anything since the game was already nearly ten years old before we learned about it. While I can hardly lay claims to being some sort of hipster, and I never have been the coolest cube in the tray, I like it when things I love become cool and popular. It’s kind of fun. What are some of the quirky things have like all along that have all of a sudden become “cool”? A few weeks ago, my debut story, Neatly Arranged, was published. Last week I participated in a blog hop about my writing style and mentioned that I want to write speculative fiction for those who hate it (or at least think they do). Neatly Arranged is a great sample of exactly what I mean. 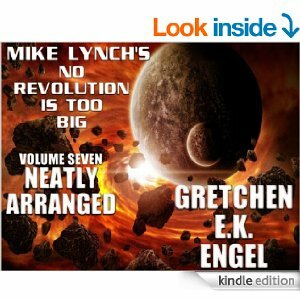 The No Revolution Is Too Big series created by Mike Lynch is about a shape-shifting, time traveler named Stelfson. He’s a revolution broker. That is he will start a revolution – for a price. It doesn’t get more sci-fi than that. Yet, I describe Neatly Arranged as “Downton Abbey” meets King of Torts with hover cars. Neatly Arranged is about Arianne, a corporate lawyer from a noble family whose parents are encouraging her to enter an arranged marriage to an earl. Arianne and Stelfson pair up to win a simple legal case and end up uncovering something much bigger. While Stelfson does morph once or twice, and admits to time-traveling, it’s not to kill his grandfather or create some other conundrum but to snag a table in the VIP section of the hottest new restaurant. My writing style focuses on my belief that character is king, and if the characters are interesting and most-likely snarky, then they can do things as mundane as discuss unicorn polo and popular novels over dinner. Naturally, there’s the other camp that is fine with characters out of central casting as long as there’s suspense and action. I got that covered, too. No, there aren’t any high speed chases or kidnappings (well, not exactly since the main character is compliant), but there are nefarious villains, deception, and the morally ambiguous Stelfson. This short and sweet post is all about promoting a great series and hopefully snagging a convert or two over to speculative fiction. If you click on the No Revolution is too big link, all nine stories come up. They all take a unique approach to Stelfson. Necessary Evil was written by one of my writing partners, TJ Akers, and is about an accountant and a computer virus of sorts. Two things people love as much as lawyers. A Sirius Revolution was written by another writing partner, Lisa Godfrees. Lisa incorporates an unusual Bible story, a classic movie, and a couple of great legends to wrap up the series with Stelfson’s back story.